The Daily Oriflame Face Care Routine is an easy-to-follow four-step routine designed to maximize the effect of your face care to achieve fantastic skin irrespective of age. All you need is two minutes, morning and evening. The True Perfection NovAge Face Care Set consists of six products for a powerful anti-aging care routine and therefore the best results. The products are formulated in order to work in synergy to maximize the desired effects. Skin enhancement and anti-aging protection in one line! 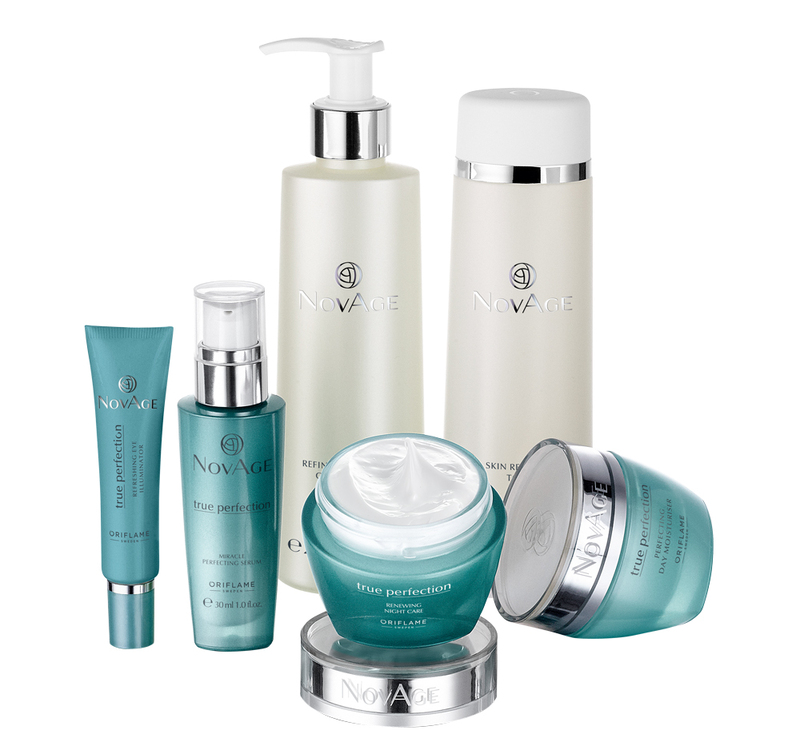 It is clinically proven that the True Perfection NovAge Face Care Set gives you 11 times brighter, 83% more moisturizing and minimized pores. It is the perfect partner for your hectic lifestyle. Start with NovAge cleaning products (Gel / Foaming Cleanser and Renewing NovAge Toner) to clean the skin, removing make-up, impurities and dead cells. These products not only leave the skin clean and refreshed, but also allow a better absorption of the following products. Then use the True Perfection Refreshing Eye Illuminator to provide the powerful technologies to the delicate skin of the eye contour, moisturizing and smoothing the first fine lines. Next, use the Miracle Perfecting True Perfection Serum to provide the powerful technologies to the delicate skin of the eye contour. Finish with Perfecting True Perfection Moisturizing Day Cream. This cream provides hydration and antioxidant protection throughout the day. At night, Night Care Renewing True Perfection instantly moisturizes and stimulates cell renewal while you sleep. NOTE: Users of multiple products may feel that the skin takes some time to adjust to an intense face care routine.If this is the case, Oriflame recommends introducing products gradually. Set NovAge Set of advanced face care potentiated by the extract of Silk Tree extract whose patent is pending, and Acai Vegetable Stem Cell extract. It hydrates and intensively purifies the skin, for a fresh and radiant complexion. Helps fight the first signs of aging. Contains 6 standard size products. 32128 Renewing Toner NovAge, 200 ml. 32596 NovAge Cleaning Gel / Foam, 200 ml. 31978 Perfecting True Perfection NovAge Moisturizing Day Cream, 50 ml. 31979 Serum Miracle Perfecting True Perfection NovAge, 30 ml. 31980 Night Care Renewing True Perfection NovAge, 50 ml. 31981 Refreshing Eyeshadow True Perfection NovAge, 15 ml. Price: £ 115.00 – £69 discount on the normal price of the products.